FYI, I am dealing with a Category 5 hurricane and cannot even get to my home to secure things. I might get stuck there, as there’s no gasoline and all kinds of traffic panic trying to get out of the state. I am in an area with no cell phone reception, so email will probably be the best way to reach me, and I’ll check it when I can. Your prayers are very much appreciated. He is just one of millions facing devastation from this very dangerous hurricane. I pray for the safety of everyone in its path, as well as those with the aftermath of the mess it left behind. For those facing Irma's wrath, please check in and tell us what's happening. I've got five relatives and a couple friends in Florida, and a lady we know escaped the Bahamas less than 24 hours before Irma hit. It seems overwhelming to think the millions in danger. Another way to follow what's happening- WPTV out of West Palm Beach streams their newscasts on http://www.wptv.com/wptv-live-video. I am on the east coast of Florida and I can tell you, this is a most nerve-wracking experience! I've been through about 8 or 10 of these things in my life and this one seems to be the worst so far. Which is weird because I'm more prepared than ever. Perhaps it's because I now have a farm and 40 animals to find secure housing for. My 9 goats will ride out the storm in large metal dog crates that will be put inside our Man Cave, which is a concrete building so they should be safer there than in the barn. My poor chickens will be caught and locked up in the main barn to keep them from blowing away. The bucks and the livestock guardian will be in our garage with the bucks inside dog cages so they don't wreck the place! All of our dogs will be given Zanax to calm them down. I live in the Florida Panhandle. I live in farm country, right near the Alabama line. All schools in Fl are now closed thru Monday. We are just outside of the current 'cone' models, but watching the 'turn' north, as it can mean we deal with just the outer edges of the hurricane, or a full on blast. Neighbors and families are communicating, plans and preps in place. Most Panhandlers who are more inland, plan to stay put, including me, while many along the coastal edges ( Pensacola ) have already left. Prayers for all. We live in SE Florida in Charlotte County NOT in a flood prone area thank goodness. Gov Scott has mandatory school, college, state office closings. 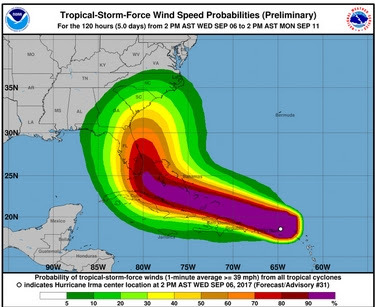 Barrier islands have mandatory evacuations as do towns SW of Lake Okeechobee, doctors & walk-in clinics are closing, stores and malls are closing - even our local Walmarts are closing at noon on Saturday - that's serious. We are sheltering in place - house is almost completely boarded up (will finish tonight), everything brought in from outside, plenty of food and water, car is charged and tank filled up. Have books to read, word puzzles to do, emergency battery lights and solar lights and some candles to eat by, battery operated radio. And the neighbors are already checking on each other. We will get thru this one as did with Charley. Keep all of Florida in your thoughts and prayers. I think you have chosen the best option to shelter-in-place. You have prepared physically and MENTALLY. I was on Pine Island for Charley (and the others in 2004) and did the same. Evacuating is NOT a no-brainer for everyone. It has many risks associated with. Hurricanes can take sudden turns as Charley did. You may actually evacuate to a more dangerous location. Lastly, after Charley fellow neighbors were not allowed back on the island for some time. You and others are in our prayers. We are breaking all records since we started keeping them. The northwest is on fire. The Gulf has never seen the likes of Harvey and Urma...and yet... some still can't see that we are clearly suffering from the throws of climate change. Isn't it time that we join the rest of the world in their quest to get rid of oil and gas and move on to clean solar, wind and wave energy etc.? Has common sense left the room? Contrary to some...jobs are just as available going green as they are living with the cancers and polluted water that we suffer with now from this industry. Other countries have made the switch and are thriving. My heart goes out to those who are currently paying the price for the ignorance of this president and his cabinet. I don't see it getting better any time soon. The president has been in office less than a year and you're insinuating that his policies have had even a minuscule effect on the climate? That's absurd. Even the strongest proponents of climate change (We're looking at you, Al Gore) agree that this is a process that has occurred over the last hundred years or so. I'm more inclined to think these events are happening because the Bible says it will. Prayers of safe keeping to everyone. My fellow Texans are over the worst part of the danger but the recovery is just beginning. The after effects are nerve racking seeing how everything from Zika to bacterial infections will be on the rise. I am not personally affected by Harvey but the state has felt it as a whole in many ways. Your right...Trump didn't create this by himself. It's been years of corporate greed that has put us here..but Trump is just an extension of that mindset. When you pull this country out of the Paris Climate Conference...give a huge green light to gas and oil...and blatantly deny there is a problem moving forward, you are giving this planet a death sentence..this when its now so critical to change directions. The rest of the world is not waiting. Most of the planet believe in 97% of the worlds scientists that are promoting people to take action from their findings. They chose to ignore bought off Koch Bros.scientists because they see and taste the evidence. Look around...poisoned water, leaking pipelines, cancerous air, warming radio active oceans, wildlife disappearing, humans alike sick and unhealthy....mega floods...record hurricanes..vanishing islands and shorelines...its in our faces and we are the cause. Thank goodness there are those who are inclined to do something about it anyway...whether the Kochs or Trump believe in it or not. wow, records as long as we have been keeping them, all 100 years out of several billion years of weather. some people really have no ability to reason as intelligent adults at all. "Intelligent adults" would be aware of several ways to determine past weather cycles...two of which are measuring tree rings and the use of extracted core samples. We don't have our hands tied in these areas of knowledge. There is still something to be realized for extreme, radical weather and earthquake patterns...even within the last several 100 years(on and off)of record keeping. But extreme climate deniers will ignore it. Irma and Harvey victims, their pets and all the local wildlife that has been effected...are in our prayers every day. Remember that with the exception of photovoltaic panels all other forms of electrical generation need petroleum -"oil". You need lubrication for bearings and other moving parts and even "full synthetic" uses petroleum based mineral oil. That electric car requires grease and oils for moving parts and the drive train, and plastic from oil to keep it light and "fuel efficient" and of course for tires. It won't get very far on bad roads once that petroleum based asphalt wears out and breaks up. Your asphalt shingles may be difficult to replace on your home also. Then there is all of the bio-hazard disposible medical products that keep us safe and food packaging too. I don't know how much of that would matter considering we cannot come close to replacing even 1/3 of our electrical power with current renewable technology. Kiss your phone, tv and computer good bye. You will be too busy trying to survive to blog or to enjoy the beautiful but now much more harsh wild natural world. A little food for thought from a comfortable denier. No one said to get rid of oil completely...just stop killing the planet and us along with it. In Central FL on the I-4 corridor. Not too worried about it for myself or my family - but there are a LOT of retirement communities here, and they consist almost entirely of mobile or manufactured homes. It's not going to be pretty. Learning a lot though, that's for sure. So many people are already saying "Why doesn't the government do this for us?" Or "Why don't they do that?". Just remember folks, it's YOUR job to take care of yourself and your family. When Walmart has no more supplies (which is true as of this moment) you will be thankful you were prepared. We are in SW Florida (not in a flood area.) Having learned many lessons from Hurricane Charley, we are as prepared as anyone can be for a hurricane of this magnitude. We have decided that our best option is to shelter in place. We live in the country just east of Tampa. We are so thankful that we are preppers. We have a generator and plenty of food and water. But, I will admit that we are anxious about where Irma makes landfall. We are certainly doing a lot of praying. That's the best prep. Florida is a mess, but so far life loss seems to be minimal-although any loss at all is sad. My Tampa friend is safe, waiting to hear from relatives west of Jacksonville. Praying for all. "Isn't it about time we joined the rest of the world in their quest to get rid of oil and gas and move on to...." (See above?) I was respond to exactly what was stated.